When you think of Amsterdam, a few things probably to spring to mind. Windmills, bikes, a certain local…delicacy (wink wink). However, this cycle-centric city has so much more to offer, well beyond the tourist-choked Red Light District. No area shows this off like Amsterdam East. Next time you’re headed to the Dam, be sure to check these spots out before you follow the crowds to centre of scandalous entertainment (although...TBH you’ve gotta see that at least once). With all the parks and flowers lining the doorways, it’s not too hard to get your fix of green in Amsterdam. However, it also rains in the Netherlands. A lot. Even in Summer. 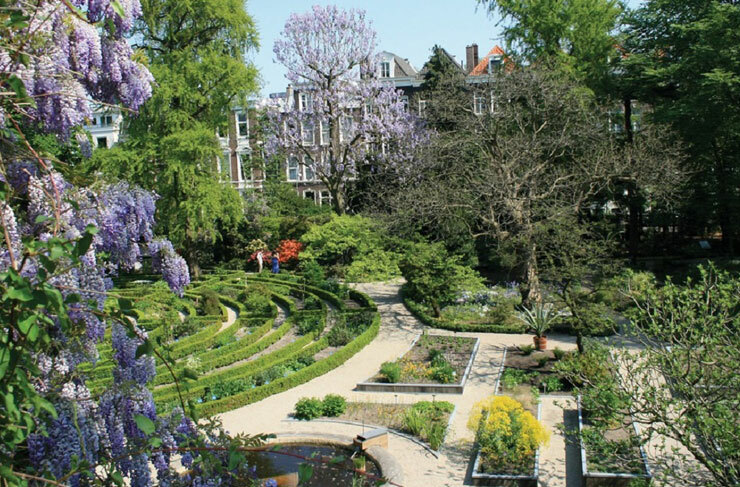 Hortus Botanicus, one of the oldest botanical gardens in the world, is your solution. Spend a couple of hours exploring the collection of over 6000 plants, and escape the rain in the Hexagonal pavilion filled to the brim with succulents. An Instagrammer’s delight. Just a few minutes away from the Hortus Botanicus, Micropia is the world’s first museum dedicated entirely to microbes. It’s a great one to take the kids to, but also pretty good for us bigger kids too. At least the ones that aren’t rampaging germophobes. Be sure to check out the Kiss-O-Meter—give whoever you’re with a big ol’ smooch and find out just how gross you both are. Guaranteed bacteria galore. Museums can be a little overwhelming in Amsterdam. Who knew so many could be crammed into this tiny city? How about a trip to the Cat Museum this weekend? Maybe the Museum of Bags and Purses is more your style? But you definitely should catch the Tropen Museum if you’ve got a couple of days. Not too large, the Tropen can be covered in a couple of hours, with rotating exhibitions meaning there’ll always be something new to check out—from body art to the latest African fashion trends. 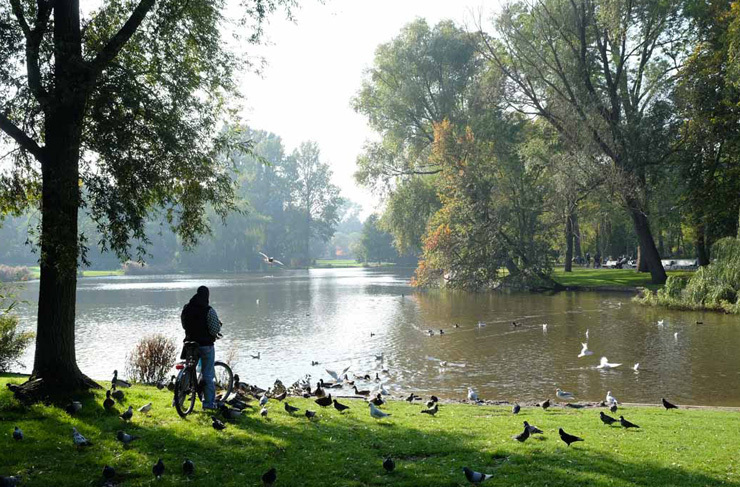 When it comes to Amsterdam’s parks, it’s safe to bet the first thing that comes to mind is Vondelpark. And hey, there’s no denying it’s a great spot. But we recommend you give Oosterpark a shot as well. Far fewer crowds, but no less beauty. Located just by the Tropen Museum, Oosterpark is a little patch of green calm amid Amsterdam’s overly-tall and handsome bustle. Grab some wine and a picnic blanket, and settle in for peaceful evening, pinching yourself that you’re in one of the best cities in the world. 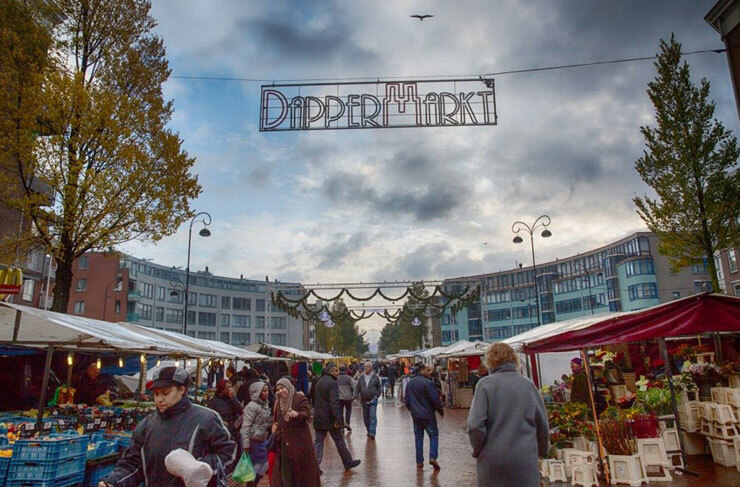 In Summer Oosterpark is home to lots of great events too—think food trucks, live music and local markets galore. Let’s be honest, we all want that ‘off-the-radar’ spot so we can brag to our mates. We get it, we’ve all been there. Even better, we’ve got you covered. 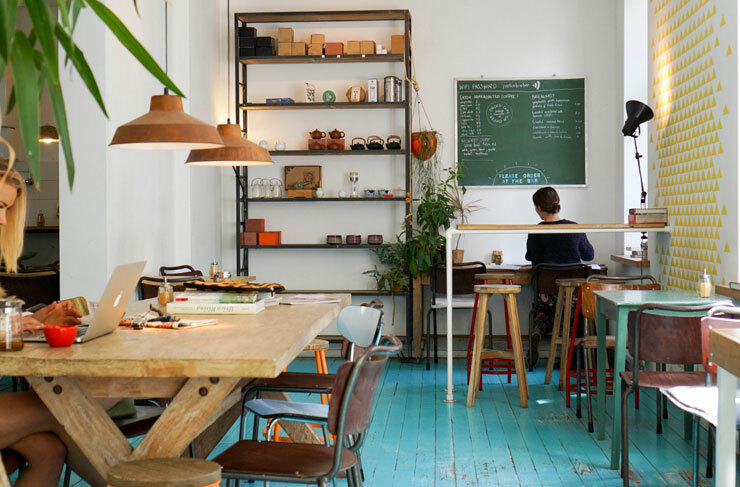 Javaplein, located in the up-and-coming Indische Buurt (Indian Quarter) in Amsterdam’s East, is a strip of funky cafes and bars, and the locals are keeping it pretty close to the chest. 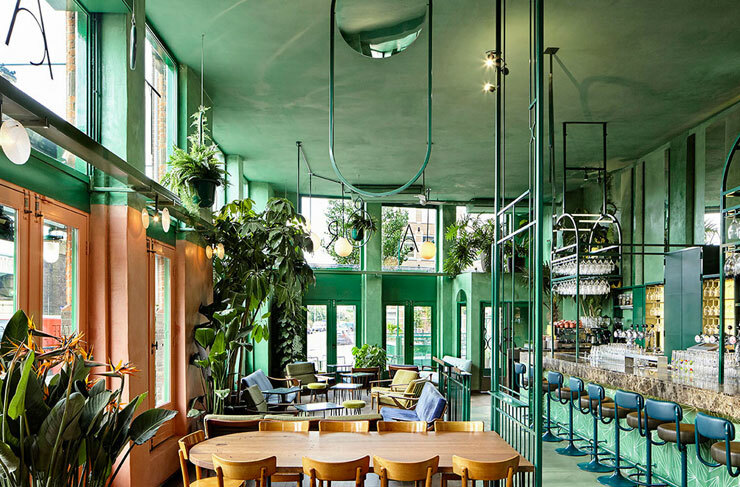 Still a primarily residential area, it’s yet to really make it onto the radar of Amsterdam travellers—meaning now is your chance to explore (and drink) without all the tourists. The main street to check out is Java Straat, where you’ll find most of the bars and a couple of groovy boutiques, but don’t ignore the surrounding areas. It’s easy to underestimate this local market at first glance, but before you write it off, grab yourself some fried kibbeling from one of the local vendors in Dappermarkt. It’s a traditional Dutch street food (battered chunks of cod served with garlicky aioli...you’re gonna smell great). This way you can tick off having eaten fish from a local vendor...without having to face the infamous pickled herring. We look after you guys. No trip to the Netherlands is complete without a serve of fries and mayo, and Freddy’s does the best in town. Mannenken Pis in the city centre gets a lot of hype for it’s array of sauces, but this recently-opened snack bar has got all you could need, and none of the queues. Get in now before everyone else catches on. Pro tip: if you’re feeling adventurous, try the Oorlog sauce. Translating to ‘war’ sauce for reasons unknown, it’s a combination of satay sauce, mayo and chopped onions. A Dutch classic. Now, we wouldn’t be a true Aussie publication if we didn’t mention a place for great brunch. Across the road from the Tropen Museum, Louie Louie is our pick for a lazy Sunday morning. A daily selection of pastries, a mean eggs bennie, Dutch pancakes—they keep it simple, and they do it well. Missing the quality Asian food Australia has to offer? Get your fix with some lip-smacking Thai from Boi Boi. They’ve got fresh dishes on offer daily, but it’s hard to go past the Pad Thai. Wash it down with a house-label Bok Bok beer and you’re in for a good evening. Amsterdam is known for its multiculturalism, and arguably no area more so than the Indische Buurt. One of the fruits of this? The mouth-watering Surinamese grub at Roopram Roti. A real local joint, you’ll be in-and-out in half an hour with a very satisfied stomach. Do as the locals do and order the roti lamb. And maybe a side of samosas. So good. My god the Dutch do baked goods well, and Oliebollen (unfortunately translated to ‘oil balls’) are the prime example. They’re basically deep-fried doughnuts, traditionally consumed on New Year's Eve (but you can probably find them here year-round). 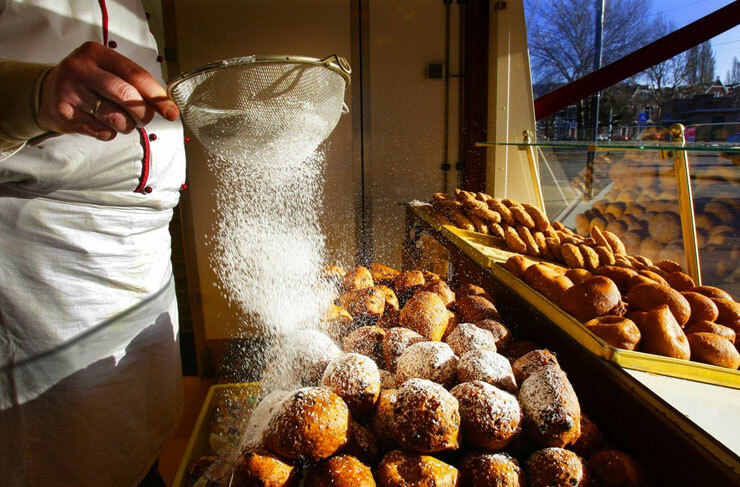 I love a bit of tradition, but I love Oliebollen Bakkerij even more. We’ll call it—the best Oliebollen in Amsterdam. Okay, so this one is technically closer to city centre than the East, but…they’re pancakes. How can you expect us to skip that? Both sweet and savoury dishes are offered at Mook, which basically means you could go here for brekky AND dinner. Mook don’t use any added salt or sugar either, so it’s about as guilt-free as you’re gonna get. It’s hard to go wrong with their menu, but our recommendation is the Infamous homemade chocolate sauce, peanut butter, blackberries, cinnamon…sorry, we’re just having a moment. This one is a personal favourite. Opening up a couple of years ago, this laid-back café knows its stuff, roasting their own beans in a bakery just down the street (head here for a takeaway cup of joe and watch the cakes baking while you wait). The coffee never disappoints, and the cakes are arguably even better. You haven’t truly been to the Netherlands until you’ve eaten Dutch apple tart, and you’ll struggle to find one better than Rum Baba. Eat with cream, alsjeblieft! Heading a little closer to the city centre for this one (but still in the east, we promise), Beter and Leuk is the perfect spot for a catch up with the girls. 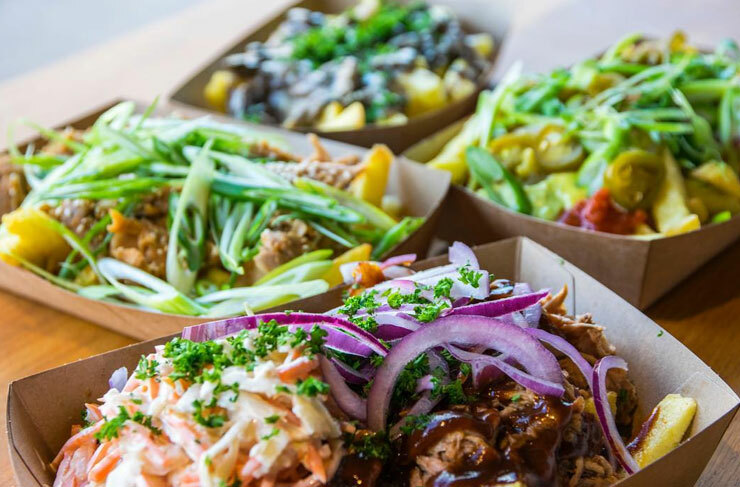 If you’re feeling peckish, they also offer a range of veggie, vegan and gluten-free lunch options, and some sweet treats. Nothing beats a freshly baked nibble as you sip your cappuccino. Bakhuys understands this, and they’re ready to deliver. Pick up some fresh bread and croissants on your way through—or even better, one of their famous wood-fired pizzas. Tucked away in the Indische Buurt, Bar Botanique is one funky place. It’s a popular spot so prepare for buzz on a Saturday night, but the crowds are worth it for the atmosphere and tasty cocktails. The food is pretty good too—try and find a better place to celebrate the end of the working week. We dare you. There’s always something going on at Roest. A refurbished factory, it’s got an industrial charm we all know and love, and there’s an artificial beach overlooking the water to boot. Unwind and soak up the sunshine with a beer in the early evening, and stay for the club downstairs as the night kicks off, regularly home to themed parties. It’s the best of both worlds. Pro tip: this one can be a little tricky to find. You’ll need Google Maps and a bit of faith. Again found in Indische Buurt (we told you it was cool), Walter Woodbury is one of the most popular watering holes in the neighbourhood. Consistently filled with locals, it’s a great spot to grab some bitterballen, the ultimate Dutch bar snack, and a local beer. Or a G&T, to round off the true Dutch experience. How could we not mention this Amsterdam East icon? Named after famous writer, Charles Bukowski, this café and bar is always heaving. Enjoy a delicious breakfast in the mornings, or settle in with a glass of wine in the evenings. Over the weekend, the space nextdoor opens up as a cocktail bar as well. The ultimate triple threat. Located near the zoo, the ever-funky Borr’l Kitchen named themselves after the Dutch term ‘borrel’, referring to an informal gathering of friends over some food and drinks. It’s pretty apt. Enjoy a range of local beers on tap and some loempia with your mates, or a signature cocktail if you’re feeling fancy. Before you book that ticket to Amsterdam, here's 10 travel hacks every Millenial should know.